The Internet of Things (IoT) is a technology phenomenon that is changing the market landscape and growing at an exponential rate. Trillions of dollars are already funnelled into IoT development each year, and that amount is forecasted to increase each quarter. IoT brings with it a wealth of market opportunities for everyone, almost no industry is untouched by IoT. With such a focus on IoT, it’s only fitting that the media leaps at the chance to leverage commercial IoT specifically, essentially causing a media evolution. The question becomes, what does this mean for PR pros and their clients? Who’s who in the commercial IoT media game? Which topics, specifically, are they covering? To answer these and other questions, we took a snapshot of the media landscape over the past three and a half months and have some interesting insights. 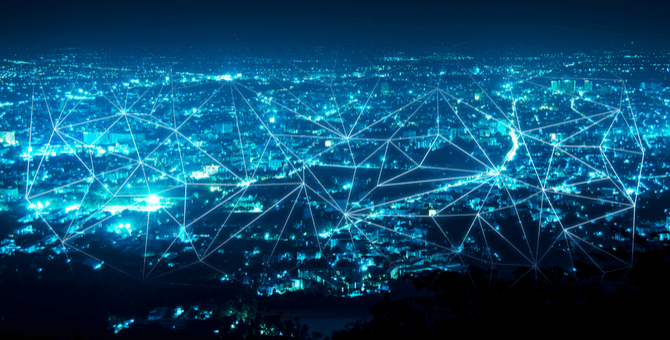 Commercial IoT sits somewhere in between the IoT tech that connects consumer products (like our refrigerators) and industrial IoT (like connecting the machines manufacturing cars). Commercial IoT relates to those technologies that play an organizational role in society as opposed to a consumer-oriented or infrastructural one. Some examples include smart street lighting or connected car platforms that tell us when our car is due for service appointment. This means that media coverage of commercial IoT falls into both trade and business publications. So let’s get to the point: who’s covering commercial IoT? We took these eight keywords and used Google News, TechNews and Meltwater to plot out a 90-day timeline of all coverage spanning from June through September 2018. From the selected time period, we pulled a snapshot of articles that covered our selected topics. Although we can’t guarantee we were able to pull every single piece of coverage, we did find more than 100 relevant articles. We then categorized them by date, publication, offered a qualitative assessment to categorize the article as a feature or a brief, and then we evaluated the type of publication – looking at trade and business publications. Just for clarification — at 10Fold we categorize briefs as articles that mention our keywords in three paragraphs or fewer. Features are articles that include content in more than three paragraphs. To separate trade and business press, publications are differentiated based on their audiences and their style of coverage (for example Forbes writes stories that demonstrate business impact for business audiences, whereas Datanami writes technology stories for CIOs and technical architects). Based on our snapshot, below is the coverage separated by publication. This pie chart absolutely demonstrates that a lot of publications, both business and trade, are covering commercial IoT. This charts also shows us that there are a lot of publications covering commercial IoT, in fact, over 60 publications just based on this research. This means that there are a variety of options when it comes to article placement and lots of opportunities for placement. Forbes seems to have the largest share of this pie. So think big. Landing a placement in Forbes is a huge accomplishment for any public relations professional. Its relative dominance in the media landscape means that commercial IoT must be a topic worth covering. However, the more interesting note is that, after Forbes, the majority of articles are written by trade publications such as IoT For All, Information Age and ZDNet. Owned content in this regard refers to contributed articles from outside companies or staff featured in publications. Vertical publications specifically refer to trade press beyond technology (real estate or retail, for example). You can see that trade publications dominate, with over 50 percent of the articles in our snapshot. Seeing that owned content is low, it’s reasonable to infer that commercial IoT is a big enough deal that media outlets aren’t hunting for content, and a reporter may take your interview! It is also important to note that there is a fair amount of business press coverage on this topic, and in our experience, business coverage is almost always better in the eyes of your clients! We can see that including “IoT” in the search seems to reveal even more results. This is significant for two reasons: the first being that IoT is a buzzword for media. You could infer from this that including “IoT” in pitches might be an effective tool to capture the attention of reporters. The other insight? Verticals are a big part of commercial IoT, including retail, real estate and smart cities. Relating IoT news to these topics makes it appealing to media that cover vertical applications. Social media will absolutely amplify your Commercial IoT coverage. So let’s talk Twitter, one of the most accessible and common social platforms for public relations plans. We looked into which companies, people and media outlets play the greatest role in the commercial IoT social sphere. Like the media share of voice, we took a quick snapshot of commercial IoT on Twitter. For the purpose of this project, we used Kred’s influencer score, which uses an algorithm to assess how frequently accounts are Retweeted, Replied to, Mentioned and Followed on Twitter to rank each account as a number between 1-1000. Based on our research, the top individual Twitter user talking about commercial IoT is Dr. Ganapathi Pulipaka, PhD (@gp_pulipaka), who currently works at Confidential. An established data scientist, Dr. Pulipaka has an influencer score of 823. His influence is due in part to his over 45,000 followers. The next top Twitter influencer is Dominic Halpin (@domhalps), the founder of TechNative, a business technology publication focusing on product news, user reviews, research, survey results, and interviews with digital business thought leaders. His influencer score is 806, and he has over 34,000 followers. These two Twitter users could be valuable assets for tech companies that want to engage their audiences on social media and boost their own influence within the IoT technology community. As for the highest-influence companies talking about commercial IoT, IBM Developer (@IBMDeveloper) is number one, with an influencer score of 865. With over 90,000 followers, IBM Developer has a significantly higher follower count than the second highest influencer, TechNative. TechNative (@TechNativeWire) coincidentally relates to Dominic Halpin, our second most influential individual Twitter user. TechNative has an influencer score of 813 and just over 38,000 followers. From this, we can assume that engaging TechNative as a company and Dominic Haplin as an asset of that publication may improve social metrics. Notable is that the top two hashtags are the same for all three categories. This means that #IoT and #blockchain are probably used together. As a public relations company, this means that it’s possible to leverage one of these hashtags in order to strengthen association with the other. Tech companies should be utilizing these topics together since it’s already expected by the Twitter-sphere. What’s important to take away from the above chart is that #IoT is significantly more present than other hashtags. As a side note, this #IoT could easily be applied beyond the realm of commercial IoT, but it is nearly impossible to reasonably distinguish the categories of usage. What’s important, though, is that #IoT is so present that companies need to utilize it in order to stay relevant. The media landscape for commercial IoT is developing at a rapid rate due to the acceleration of the application of the technology. Based on our research, there are plenty of opportunities for coverage in both the business press and trade press. By following the insights about publications and reporters, and using keywords and hashtags – PR professionals should have a field day delivering commercial IoT coverage and building social audiences.